Keynesian economics is a perpetual-motion machine for statists. The way to boost growth, they argue, is to have governments borrow lots of money from the economy’s productive sector and then spend it on anything and everything. Even if the money is squandered on global defense against a make-believe alien attack, according to Keynesians like Paul Krugman! Krugman also has argued that a real war is good would be good for growth since the goal is simply more spending. Heck, Krugman even asserted the 9-11 attacks were good for the economy because governments then spent more money. And Nancy Pelosi actually argued that paying people not to work was a great way of creating jobs. I’m not joking. Amazing. It’s almost as if these people are secret libertarians and they’re saying crazy things to discredit Keynesianism. But they’re actually serious. This makes it difficult to tell the difference between satire and reality (though this collage is a good example of the latter). I’ve explained (over and over again) why the Keynesian theory is misguided, and even narrated a video on the topic. But I suspect most people are more convinced by real-world evidence, which is why I’ve used data from nations such as Germany, Japan, Switzerland, Canada, the United Kingdom, and the United States to show that bigger government generally hampers prosperity. Now let’s add to this wealth of evidence, but this time focus on developing economies. Ruchir Sharma, head of emerging markets for Morgan Stanley Investment Management, has a column in the Wall Street Journal that reviews the track record of so-called stimulus in developing nations. He starts by noting that some of the usual suspects are pushing for more Keynesianism. …expect more big names to join the chorus calling for increased government spending to enliven the flailing global recovery. President Obama and Treasury Secretary Jack Lew are among the voices urging European leaders to spend more. The International Monetary Fund and former Treasury Secretary Larry Summers —who wrote in the Financial Times in October that “there is for once a free lunch”—have even been arguing that government borrowing to build roads or airports would more than pay for itself. If only governments in the developed world would start spending more, this refrain goes, the global economy’s future would be brighter. But Mr. Sharma explains that many countries in the developing world just had a very bad experience with Keynesian economics. …it is worth noting that the big emerging nations—China, Russia and Brazil—have just tried a full-throttle experiment in stimulus spending, and it failed….Their experiment began in late 2008. …the leaders of these nations turned to the ideas of John Maynard Keynes… The emerging economies embarked on a spending campaign that dwarfed its counterparts in the U.S. and Europe….The emerging ones spent more than half again as much, 6.9% of GDP. And that figure does not include the money that many big emerging nations continued to pump into their economies by ordering state banks to ramp up lending. These directives vastly boosted the scale of the stimulus, particularly in China… Keynesians everywhere let out a cheer. Here’s some of the data. Since 2010, the growth rate in China has fallen by a third and is headed below 7%. Brazil is in recession. Russia, which spent a staggering 10% of GDP on stimulus, is now contracting sharply. What happened? Emerging nations borrowed from the future to produce that flash of growth in 2010, and now they face the bills. Their government budgets have fallen into the red…public debt has risen significantly, throwing the books out of balance. …the IMF and others are lowering forecasts for emerging-world GDP growth for the rest of this decade to 4% or less—a return to the pace of the crisis-ridden 1990s. …The message: When the state spends in haste, it will repent at leisure. Many leaders in emerging nations now recognize that bigger government is not a recipe for prosperity. …emerging-world leaders admit that their own stimulus experiments backfired. In May, Chinese Premier Li Keqiang warned that using stimulus to generate growth is “not sustainable” and “creates new problems.” …Agustín Carstens, the president of Mexico’s central bank, recently told me that in the long run “fiscal and monetary policy cannot create growth.” And former Indian finance minister P. Chidambaram admitted that his government “lost control of the economy” because of a stimulus campaign that led to higher deficits and inflation. I guess we can add these officials to the list that already includes leaders from Portugal and Finland, who also have acknowledged that economic growth is undermined when the burden of government spending is increased. Unfortunately, the lesson isn’t being learned in America, at least not in the rudimentary reading class that is otherwise known as the Obama Administration. P.S. 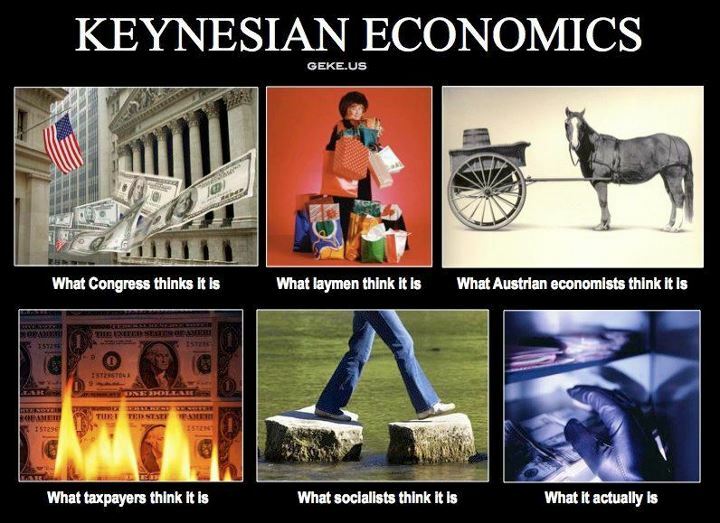 You can enjoy some good anti-Keynesian humor by clicking here, here, here, and here. P.P.S. There are some Republican Keynesians, so this is a bipartisan problem. P.P.P.S. Happy Birthday to the Princess of the Levant. We’re celebrating in the Cayman Islands, where there’s warm sunshine, clear ocean, and zero income tax. P.P.P.P.S. Returning to the unpleasant topic of Keynesian economics, it’s very discouraging that Obama Administration officials seem so intent on pushing bad policy in other nations. P.P.P.P.P.S. The New York Times publishes a lot of Krugman’s diatribes, but they also make room for other fact-challenged Keynesians. P.P.P.P.P.P.S. For those of us who try to educate policy makers, Keynesian economics is like a Freddy Krueger movie. Along the same lines, there are plenty who would argue that this is a consumer-driven economy. So, to get the economy rolling again, we really need to do whatever we can to get consumers to spend. It really doesn’t matter what consumers are buying as long as they are buying. Of course, following this argument to its logical conclusion… if every single family in America went out and bought a Ken and Barbie Tea Party Set, our economy would boom. Would live to put this on facebook ….! !